This new Photoshop Brushes set features fifteen hand drawn arrows, these are all very large and will be cool for adding to hand drawn backgrounds. If they are applied to separate layers, they can also be rotated and flipped. All the arrows are drawn in pencil, some with simple line work and some are shaded in. 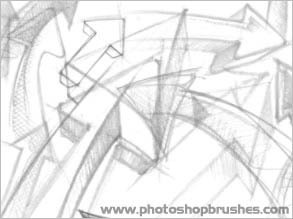 There are more of my Scribbles and Sketches available as ps brushes on this site.